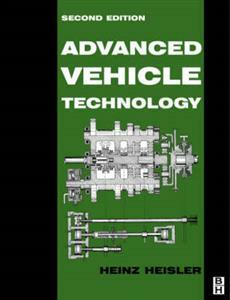 This eagerly awaited second edition of Heinz Heisler's Advanced Vehicle Technology is a comprehensive and thorough description of vehice bodies and components. The second edition has been rigorously updated to provide additional material on subjects such as antilock braking, vehicle aerodynamics, tire tread design advances, electronically controlled anti-vibration engine mountings and transport refrigeration. Around 100 new diagrams have been included to complement the text. Advanced Vehicle Technology 2nd edition's depth of coverage, detailed illustrations and fluent and precise style are the outstanding features in this high quality student text.